Because of its unique immigration history, Peru’s cuisine encompasses the world’s most eclectic mix of flavors. And in its capital city, an international Pacific Ocean port—where in cuisine terms, east meets west—the tastiest of raw fish dishes was born. 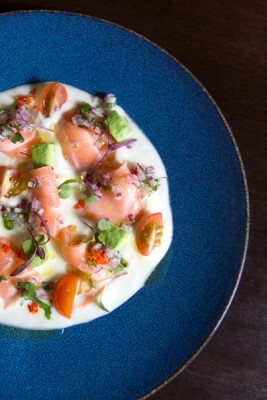 Lima is the ceviche—or cebiche if you’re from there—capital of the world. In coastal Peru, the art of its preparation approaches the divine. 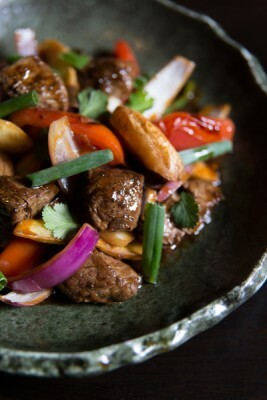 But Peruvian cuisine long ago transcended the Americas. Lima native, Jesús Delgado, now known as “Chef Jesús,” was born to cook. His aunt owned a cebichería, his father owned a small business selling produce, and his grandfather, a Chinese immigrant, was part of the Chinese culinary community in Lima. Delgado’s grandfather owned a mini-market, sold food to restaurants, often cooked at his friends’ restaurants, and when he cooked for his family, would take his grandson into the kitchen. It is no surprise that Delgado’s first job was at the largest Chinese restaurant in Lima, Chifa Royal. Delgado next worked at Lima’s Ichiban—famous for artistic Japanese dishes from sushi to flaming meat cuts—where he worked with Diego Oka, and the two met Gastón Acurio for the first time. Acurio is a restaurateur of international fame, owner of some 50 restaurants in major cities all over the world. Oka is now the executive chef at Acurio’s La Mar in Miami. The two young Acurio protégés remain close friends. “As destiny would have it,” says Delgado, “we both went on to work for one of our idols, Gastón Acurio.” Delgado and Oka were both on the team of chefs that opened the first La Mar in Lima. “It was the best opening team I have ever been a part of,” says Delgado. “The opening was intense, as the restaurant was extremely popular right away, but the team was strong.” At 24 years old, Delgado ran the cebiche bar at Lima’s La Mar. Three years ago, an idea for an Acurio restaurant in Chicago with Delgado as executive chef was conceived. “It couldn’t be another La Mar like the restaurants in San Francisco or Miami, because Chicago doesn’t have a mar,” Delgado says. “It’s in the middle of the States.” It would be called Tanta Chicago. Tanta means bread in Quechua. It is also the name of one of Acurio’s most popular restaurant brands worldwide, with eleven Tantas in Lima, five in Santiago, one in Panama City, one in Barcelona, and one in Madrid. But Chicago’s Tanta is one of a kind. 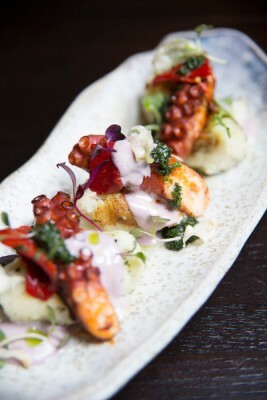 Its menu showcases the best of Peruvian cuisine, including Chinese, Japanese, native South American, Spanish, and other global influences; even inspiration from anticuchos—street food. The first eye-catcher on a beautifully varied menu is the list of cebiches. “You can’t have a Peruvian restaurant without cebiches,” says Delgado. The young chef has been making cebiche since he can remember. Yet any good menu requires some change. Any menu changes, like winter special short ribs—marinated and cooked for 17 hours—are Delgado’s own creations. He considers Tanta to be his “baby,” and gets inspired to create new culinary works of art around the seasonal produce available or even flavors from his childhood. “I love challenging myself to change things up with the menu. I have to keep being creative,” says Delgado. The restaurant has a wonderfully comfortable vibe and a living personality, with a lively rooftop in summer and an intimate, playfully provocative ambiance in the winter. It’s casual, friendly, and fun. “We just want to make people happy,” Delgado says, which they undoubtedly do with their famous pisco sour, which seems to insist on being ordered. Tanta Chicago is a reflection of both the perfection for which Gastón Acurio is known, and the friendly, eclectic, and welcoming nature of its executive chef. It is the right combination of creativity and tradition, of changing without changing too much.